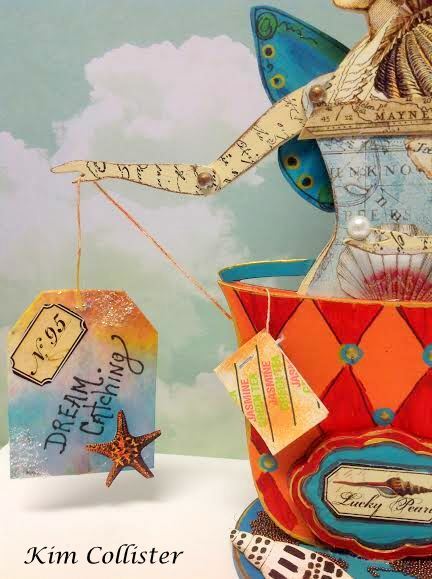 Welcome to my July Post for Retro Cafe Art Gallery, it's all about Tea, Dreams and Time Out. Afternoon Tea is not a priority that I have placed in my life, it requires more scheduling and time that I already feel disappears minute by minute each day. I am by nature more of a coffee drinker than tea, although I do admire the quality quiet time that comes with the ritual of afternoon tea. There seems to be a rite of passage when you set aside time for tea. When it comes to tea, I am a dyed in the wool iced tea porch drinking Southern, and whether you drink tea hot or cold, there is definitely more to afternoon tea than what's on the serving tray. Since the label on her cup says: "Lucky Pearl", I thought it was only fitting that she was holding a Pearl. 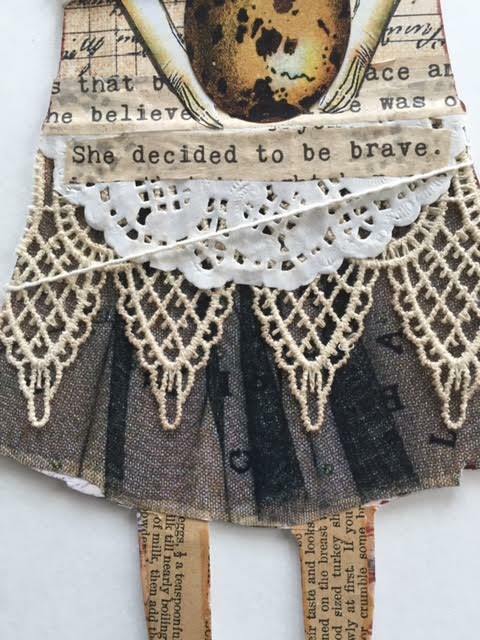 I am sure she found it in her Tea Bag as she was Dream Catching. If you want to read the story that inspired the theme for my Teacup Fairy, she will be published in the Jan/Feb 16/17 issue of Somerset Studio Magazine. You also get a great deal if you pre-order. I lay out all my pieces and dust off any residue. 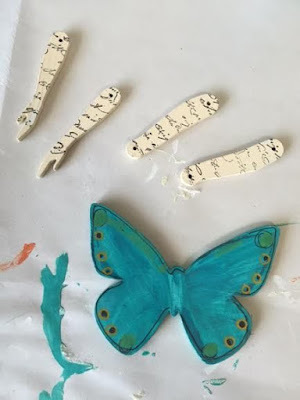 If I am painting and not covering with paper, I gesso the pieces using white gesso. I chose a face from my personal stash. This face was larger than the face on the body so I glued it to a thin cardboard and cut around it, making it more durable. Retro Cafe has a variety of faces that fit these kits perfectly. I painted the arms and stamped them with a word script rubber stamp and set aside. 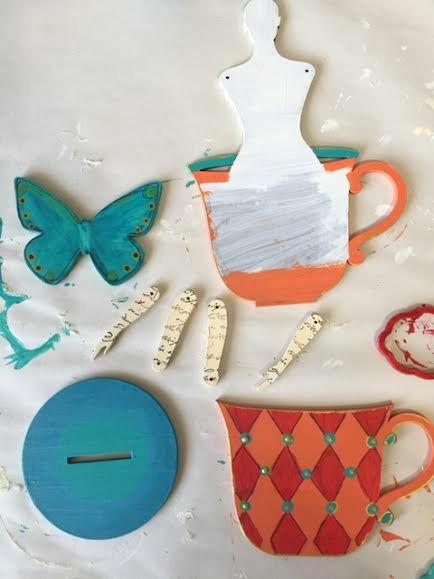 I used a stencil on the tea cup on top of my base color and let dry and then used a black gel pen to go around the design, also adding some dots of green paint. After the dots were dry, I added a gold dot from my Gold Pearl Pen. 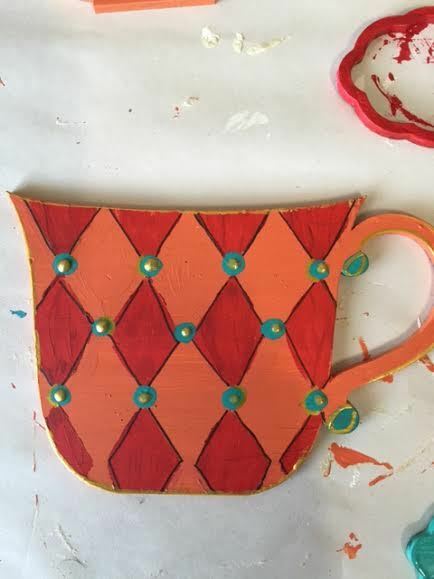 I let the cup dry and then went around the edges with some gold paint using my fingers.On the body I only painted the parts of the teacup on the body that would show since I would be gluing the teacup piece above onto the body. 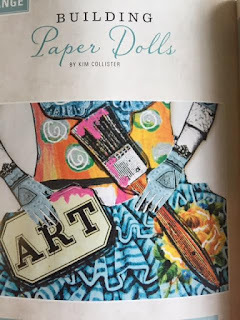 I added paper to the body using a map design from one of the ATC collage sheets from Retro Art Gallery. I knew I wanted to incorporate a tea bag with this tea cup,so I went with a side view face that I had in my personal stash. I placed the right upper arm on top of the body with the included brads and the left upper arm behind the body which gave it just the look I was hoping for. Before gluing on the top tea cup piece, I put the tea bag string on the front body and placed the tea cup piece over it with the tea "tag" hanging over the cup. After attaching the arms, I draped the tea bag over the arm. I put a dab of Inka Gold – Gold/Brown on the top of the brads so they weren’t a shiny silver. 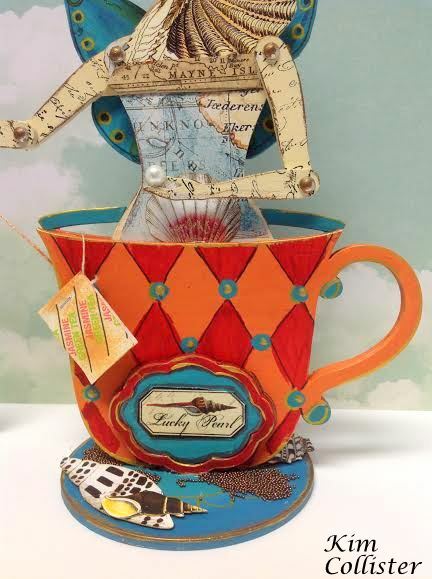 The tea bag was made by first emptying all the "dry" tea and spraying a wet paper towel with Tim Holtz Dylusions spray inks, and then blotting the tea bag onto the wet paper towel where I wanted to add a little color to the tea bag and the tag. I let it dry and then glued on shells and used a black gel pen to write on the bag and finished it with some Fairy Sparkles. 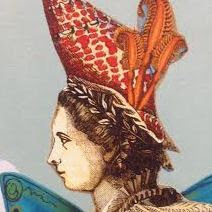 On the bottom stand or saucer for the cup, I added two colors of blue blending them, edged the rim with Gold Rush Art Alchemy Paint, added some Art Ingredients Micro Beads, and some shell paper cuts. For the Butterfly Wings, I used a blue acrylic paint and blended with Prima Art Alchemy Emerald Green. Then I took my black gel pen and added some enhancements. 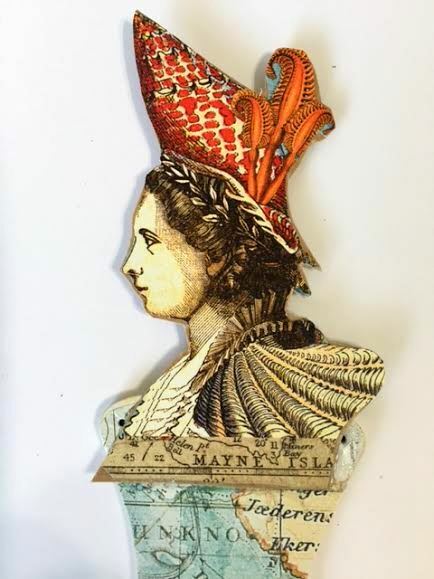 After all the pieces were painted and papered and I felt comfortable with how they looked, I began assembling the pieces together using a clear strong glue. The last thing I glue on is the face and then when everything is dry, I glue the entire piece onto the stand. Lastly, I added finishing touches around the edges where needed and I painted the back side a solid brown just to cover up my messiness back there. 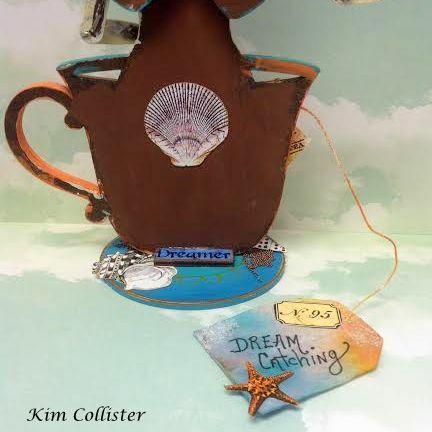 I added a shell and the word DREAM and some Mirco Beads at the base. There are many, many possibilities with this Teacup Fairy and there are different versions available! 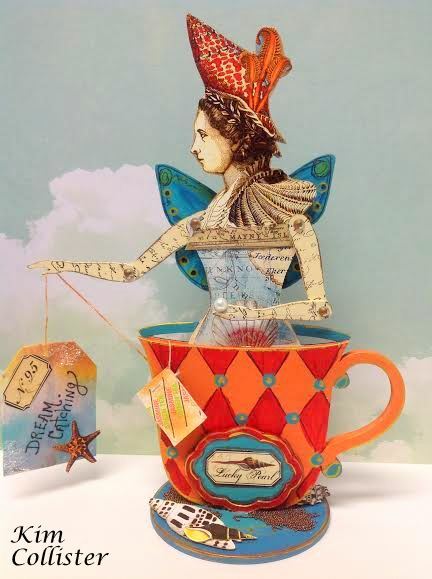 What a wonderful way to remind a friend that you are Dreaming and thinking of them when you are taking some time out and enjoying afternoon Tea! 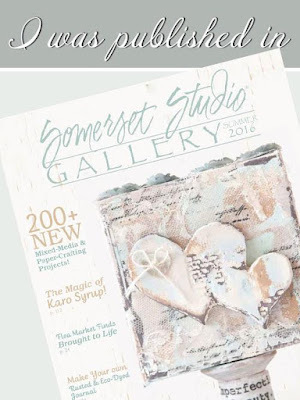 Summer has started out with bang with this Arkansas heat and humidity, but I am staying cool and celebrating my good fortune to be published in Stampington and Company's newest edition of Somerset Studio Gallery-Summer 2016 featuring my Tag Journal. 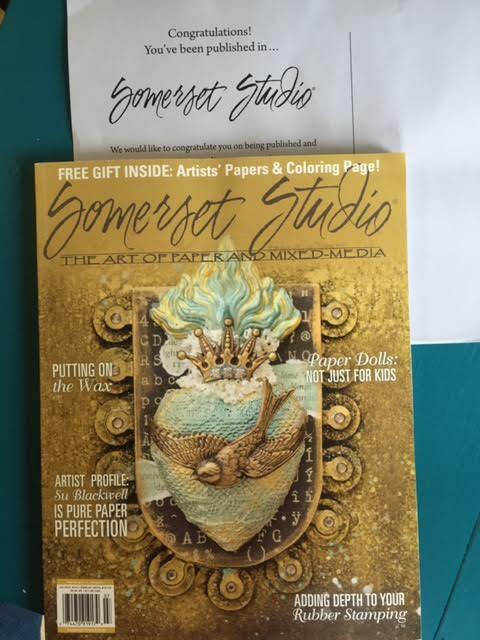 Available on news stands June 1 st.
And if that wasn't exciting enough, I am also published in the new July/August 2016 Edition of Somerset Studio available on news stands July 1st. 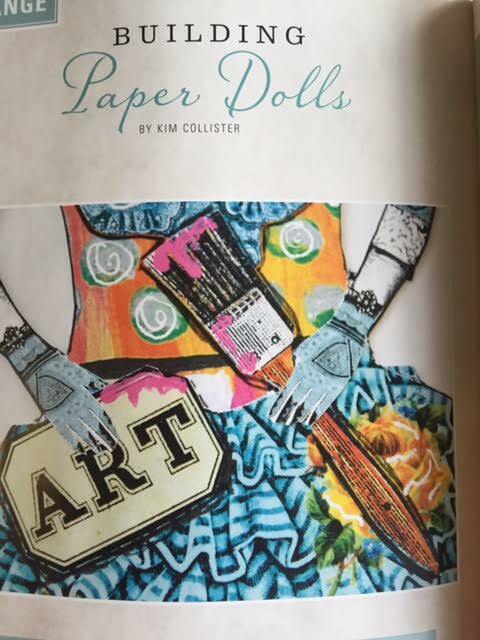 featuring my handmade paper dolls. Both of these magazines are packed with Beauty and Inspiration from a variety of amazing artists. 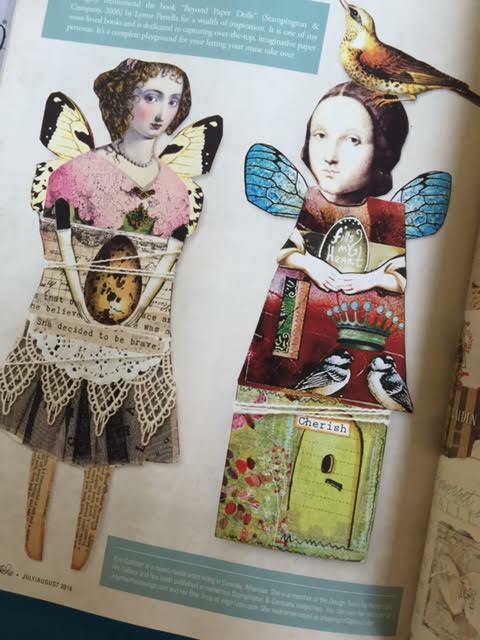 Stampington and Company never disappoints when it comes to their awe-inspiring magazines. 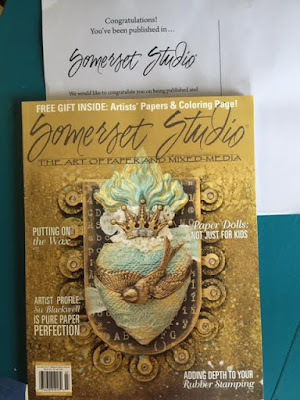 If you can't find one near you, you can go to their website and order one online or better yet subscribe because in the end, you are going to want every issue. Put it on your Gift Wish List like I do! 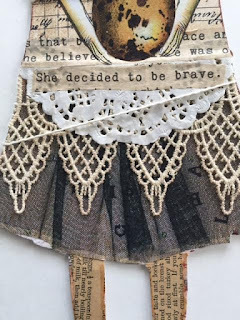 Hugs for a Great Summer - Be Brave,Stay Cool, Be Inspired! 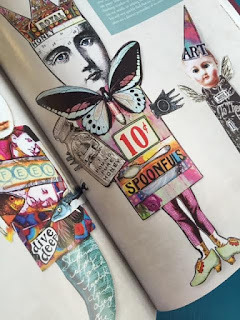 I knew one day my big over-sized imagination would land me somewhere besides the corner, time out and being grounded! :) Grateful for the gift that has allowed me to see things differently, to be a forever optimist that always believes I can until I am proven wrong.. (and then we'll see). Thankful for all the wanderers on my path that inspired me along the way and for the courage and curiosity to always take the unpaved road! 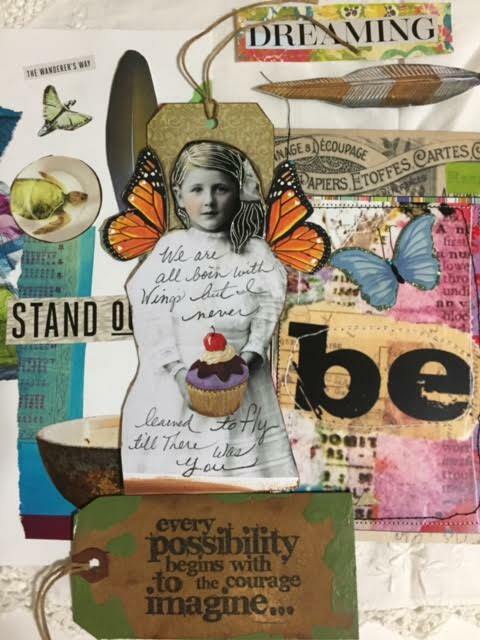 Keep Dreaming, Keep believing, Be who you Are and Do what you Love... that's a Good Life. 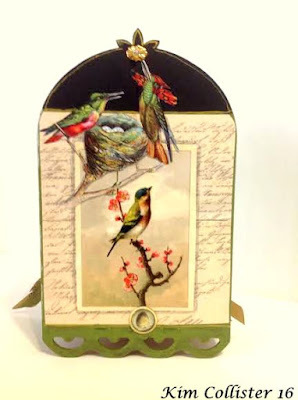 If you followed the post prior to this one, then this is the continued post about the Large 3-D Bird Cage Shrine by Retro Cafe Art Galley showing a new design I created with it using different designs of the Dresden Foil trims. 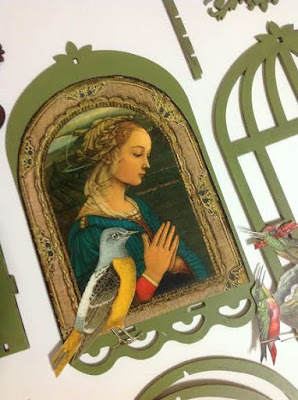 I started by painting all my pieces of the bird cage shrine first. 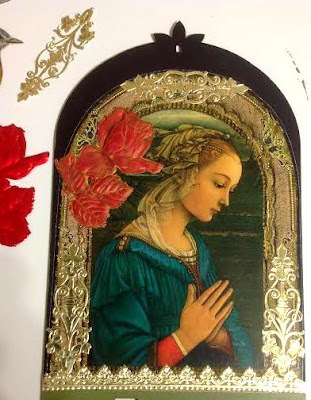 Next I picked out my paper and images for the collage on my back piece of the cage that will face the inside. I added my Dresden Foil trim to my image before gluing it to the back piece. The Dresden Foil pieces are so versatile in the fact that they can be cut and used in so many different ways. The rose I added is also Dresden Foil in shiny red. I added some orange acrylic paint to it and lightly rubbed it off. Next adding some antiquing medium to give it more of a vintage look. 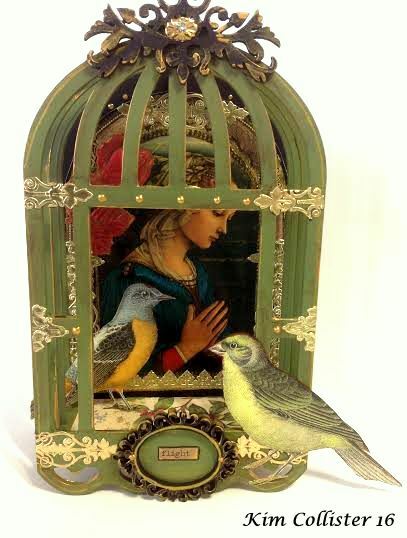 The very top piece comes with the Bird Cage Shrine. 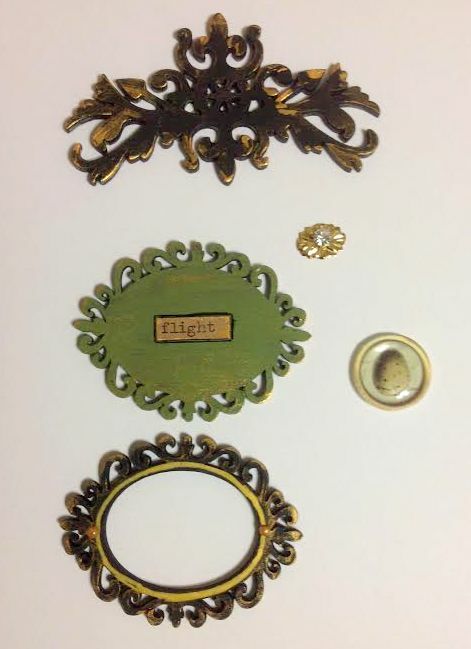 The oval frame is a piece that I added from Retro Cafe Art Gallery to attach to the front with the word "Flight" added to it. The tiny gold ornate mini door knob also from RCAG was a perfect addition to the scroll top piece. 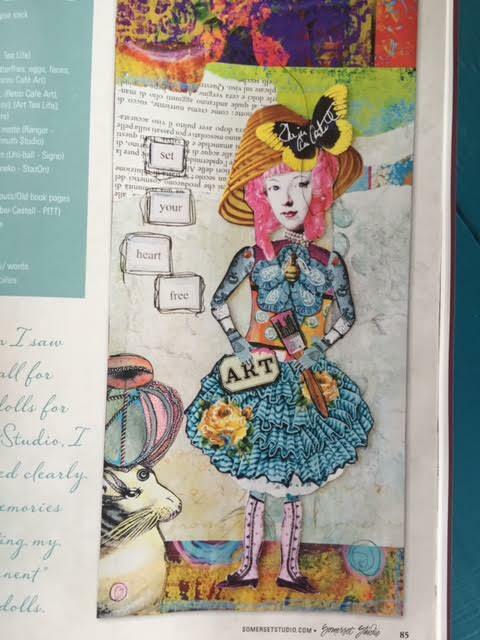 On the back side of the collage I added another little gold jeweled mini door knob at the top. After painting and adding my images, I used a Gold Signo Pen to outline the back part of the cage, and continuing the same with the front side. 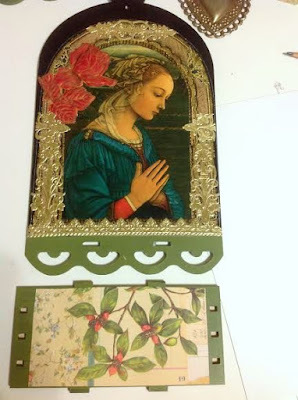 I used 7 Gypsies paper for the bottom piece, top and bottom. This gives you a closer look inside. 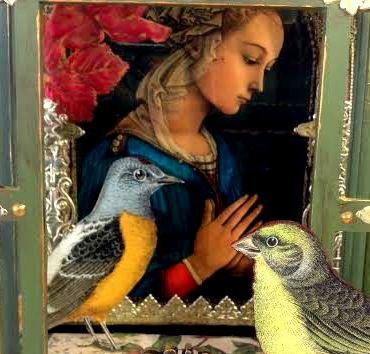 I love the dimensions and the 3-D effect you get from this Bird Cage Shrine. 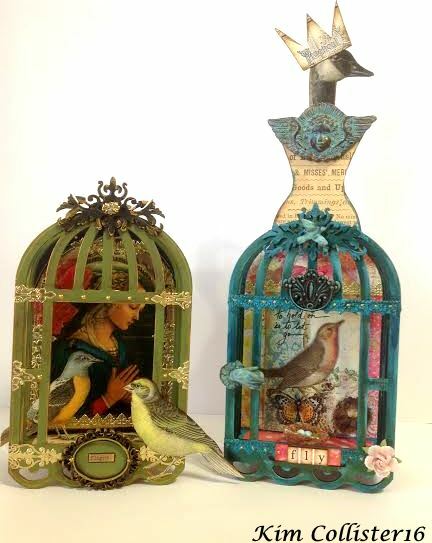 You can see the Dresden Foil Collage on the back piece and the pieces on the front really add beauty to the bird cage. 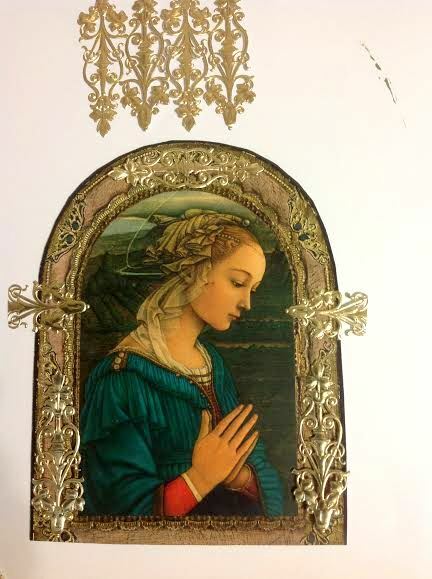 I used the Art Alchemy Gold Rush Paint for gold touches on the top black scroll piece, the oval cameo word frame, the feet and on the edges of most all the cage pieces. I added one bird in the middle, not attached to the back side and one bird on the front giving it even more of a 3-D look. 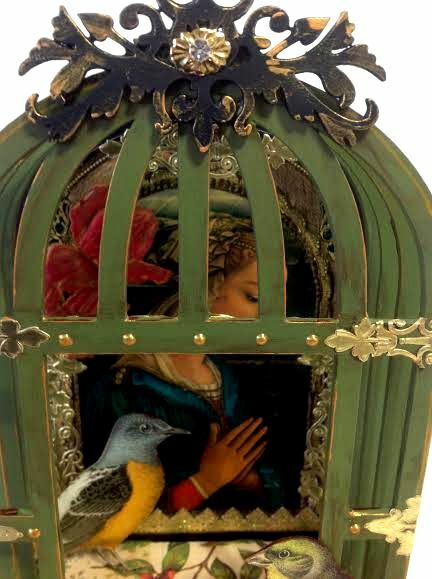 For this bird cage, I added some wooden beads for feet. It just lifts the cage a bit higher. 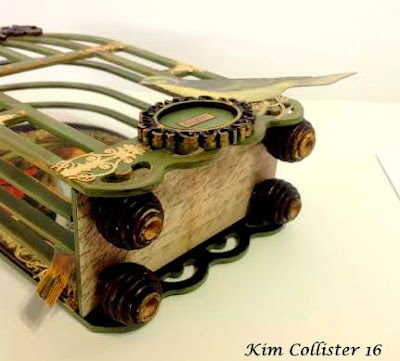 If you are going to make one of your own, you could even attach a ring the top of the cage and put it on a stand. "See, I told you there are endless possibilities with this fun piece." You have to make one of these Bird Cage Shrines, and probably more than one because everyone who sees it is going to want one too! 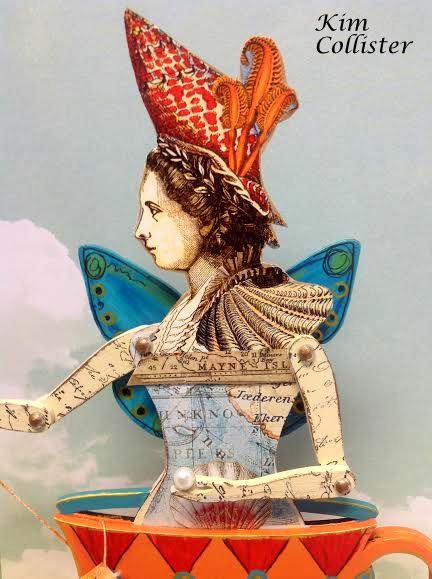 They are really simple to assemble and the result is all you and where your imagination can take you. Thank you for viewing both of my posts. 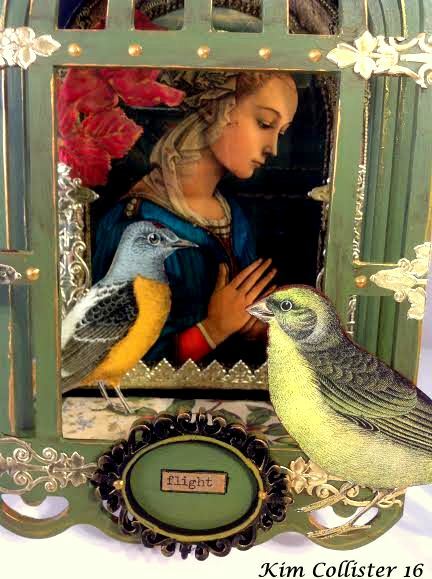 Wishing you loads of fun creating one of your own Bird Cage Shrines!